Shyp is a mobile app for easy, on demand shipping worldwide. All of these questions require resolution prior to approval of any transition plan..."
*Note: Editor of Domain Mondo, John Poole, is a "participant" in the IANA transition CWG-stewardship process. Hibernating NetMundial rattles internet governance world at Davos • The Register: "... Even though the Davos launch was dumped, Chehade is attending the elite conference and has already ruffled feathers by continuing to promote NetMundial at a closed meeting of bigwigs... according to a Reuters reporter who was present. His remarks reportedly were not popular and sparked concerns of an elite group taking charge..."
I guess Fadi is finding out that his top-down vision of internet governance--the NETmundial Initiative, (reportedly funded a/k/a astroturfed, at least in part, by ICANN money)--is as hard to sell as ICANN's new gTLD domain names! After all, when an elite gathering of the rich and powerful are alarmed that your idea sounds like an elite group taking charge of the internet, maybe it's time to stop and listen, and consider dropping the whole charade. But if the track record of ICANN ignoring sound and wise advice in its new gTLDs program is any guide, Fadi Chehade will continue to make a pest of himself at Davos, until Klaus Schwab says "enough!" "This is an official notification regarding a cost increase for .NET domain names. VeriSign, the registry responsible for .net, is raising its costs for .net domain registrations, renewals, and transfers. As a result, we are forced to update our prices as well. On January 30th, 2015, the new price for .net domains will be $12.48/yr. 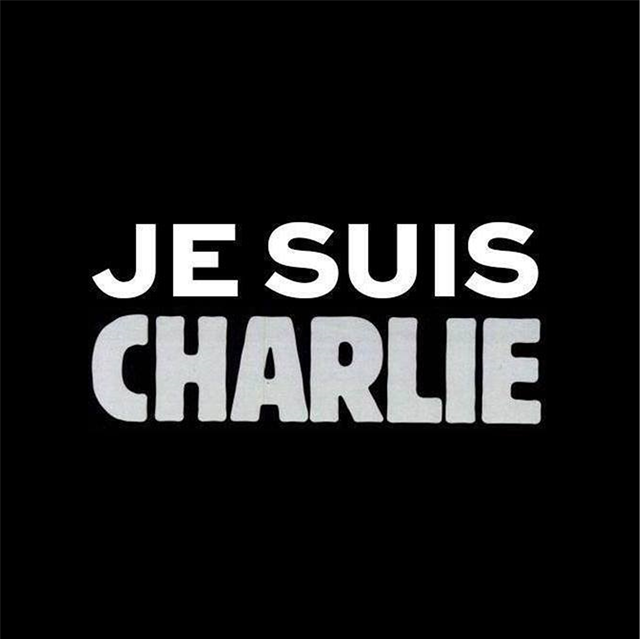 + the ICANN fee. We will continue to offer multi-year registration and renewal discounts on our site. In reaction to this increase, we are having a Renewal Special on the 29th of January ($0.98 off your regular renewal rate). You will not need a coupon to take advantage of this deal. Just process your renewal and the price will automatically update in your cart. Mark the date, as it's coming up quickly. If you cannot join us on Friday, 29th January, we highly recommend that you renew any .net domains (for multiple years) prior to January 30, 2015, in order to take advantage of your current price and to save money in the long run." In addition, Namecheap is having a special MoveYourDomainDay on January 27th: "... we hosted the first official MoveYourDomainDay in 2012 as a call-to-action for those who opposed SOPA and wanted to leave service providers who supported SOPA and other such ill-conceived legislation. Every year, our lawmakers propose new laws restricting internet freedom. That's why we continue to fight on with our annual MYDD. To our loyal clients: Thank you for being part of this important work. Every year, as part of our MYDD effort, Namecheap donates a portion of the day’s sales to online freedom fighters the Electronic Frontier Foundation. EFF is a donor-supported membership organization that works to protect fundamental rights regardless of technology and to educate the public about digital rights ..."
"MoveYourDomainDay will happen again on January 27, 2015. On that day, you can transfer your .com/.net/.org/.biz/.info for only $3.98 (plus applicable ICANN fees) with coupon code NC15MYDD, and you get an additional year on your domain name when you transfer. Shared hosting plans (Value, Professional, Ultimate) will all be 50% off with coupon code MYDDHOST15." Namecheap: "The transfer coupon is limited to 50 domains and one usage per household/business. You keep any remaining time you have on the domain when you transfer, and the transfer process adds one more year. So if you have 1.5 years on the domain before you transfer, you’ll have 2.5 years afterward." "For every domain transferred or hosting plan purchased, up to 10,000, Namecheap will donate $0.50 to the Electronic Frontier Foundation. The donation amount goes up to $1.00 per domain/hosting plan if we exceed 10,000. And if we exceed 20,000 domains transferred/hosting plans purchased, Namecheap will donate $1.50 for each transaction. The Electronic Frontier Foundation is the leading non-profit organization defending civil liberties in the digital world. Founded in 1990, they fight for online privacy rights, internet freedom, and anti-censorship. Visit them at www.eff.org." Zenefits: Free Online HR Software: "One platform. All your HR. Benefits, payroll, onboarding, time off, and more." "Zenefits is Free. Really. Free. So how do we keep the lights on? If you choose to manage your benefits through Zenefits, we get paid by the benefits providers—for example, your health insurance carrier. Your current benefits pricing isn’t impacted in any way, shape, or form. Even if you choose not to add your benefits, Zenefits’ core features are absolutely free to every employer. Why are we the only free service in town? Unlike PEOs, HR outsourcers, and HR software providers, our technology enables us to operate profitably on the revenue share paid to us by the benefits providers on our system, which allows us to keep Zenefits free for you! No hidden fees, contracts, or surprises. Are there any contracts or agreements? Nope! Because we don’t rely on admin fees to be profitable, we’re happy to work with you for as long as you like. With Zenefits, cancelling your account is as simple as clicking a button. (Not that you’d ever want to.)" World Economic Forum Annual Meeting 2015, Davos-Klosters, Switzerland, 21 - 24 January 2015 - Who's missing? Fadi Chehade and the NETmundial Initiative, but ICANN CEO Fadi Chehade explains why in the first video below. What is needed to ensure a thriving, open and secure digital economy? Domain Mondo has no idea what Mr. Conrad's reference to Verisign being "stark-raving-greedy" has to do with the IANA Functions or Internet Root Zone Management since it is well known that Verisign receives no fee for performing its services as Root Zone Maintainer. Is he implying that Verisign has started demanding "stark-raving-greedy" fees for performing its services as the Root Zone Maintainer now, or in the future? Also, the Chief Technology Officer of ICANN, speaking only for himself, did not elaborate on exactly how the Internet root zone management processes "MUST change" nor how those changes will have DIRECT operational impact on the Internet. Stay tuned--things are getting interesting in the IANA Stewardship Transition process! For more information on the CCWG-Accountability meeting in Frankfurt, including the link to view the meeting online go to expvc.com. The Wall Street Journal has reported that "... [Google] is lobbying U.S. regulators to free up vast amounts of low-cost, mostly vacant spectrum that could serve as an alternative to the big carriers’ services. The plan that Google and others are backing would open up as much as 150 megahertz of spectrum around the 3.5 gigahertz band, pushing to make it usable by all comers without a license while still leaving some of it available for companies to use exclusively. The 3.5 gigahertz airwaves aren’t much use to wireless carriers, because they aren’t good at carrying signals for long distances. But they are useful for delivering heavy loads of data in cities, which could make them viable for a lot of typical wireless needs—the way Wi-Fi is now, but potentially broader and more available. The spectrum would enable startups funded by venture capitalists, for instance, to build speedy wireless networks in parks, buildings or public areas relatively inexpensively, thus making it cheaper for consumers to access the Internet ..."
Google FCC Wavelength Bid Airwaves - Business Insider: "... In a filing with the FCC, [Google] executives said they were "helping to make Internet bandwidth more abundant ... The broadband ecosystem will be well-served by a policy environment that removes barriers to investment, discourages monetization of scarcity, and empowers consumers."... an ongoing auction for a portion of the spectrum bids are approaching $45 billion. In recent years, Google has been moving increasingly beyond its purely online roots and into the network sphere. The search giant has been slowly rolling out its ultra-fast broadband connection Google Fiber in various US cities since its launch in 2011, challenging established internet providers like Comcast and AT&T. Google is also experimenting with Project Loon — an attempt to bring the internet to developing countries, rural areas, and disaster zones using high-altitude balloons." Anna Lee Saxenian, author of the classic book "Regional Advantage," still thinks the Silicon Valley area's future is bright. Note the difference between descriptive and distinctive marks: Trademark distinctiveness - Wikipedia: "Trademark distinctiveness is an important concept in the law governing trademarks and service marks. A trademark may be eligible for registration, or registrable, if it performs the essential trademark function, and has distinctive character. Registrability can be understood as a continuum, with "inherently distinctive" marks at one end, "generic" and "descriptive" marks with no distinctive character at the other end, and "suggestive" and "arbitrary" marks lying between these two points. "Descriptive" marks must acquire distinctiveness through secondary meaning - consumers have come to recognize the mark as a source indicator - to be protectable. "Generic" terms are used to refer to the product or service itself and cannot be used as trademarks...."
Showing Common-Law Trademark Rights in a UDRP: "... the UDRP is only designed to be used by a complainant who owns the rights to a trademark that has been infringed upon by a domain name. Typically, trademark rights are proven in UDRP complaints by showing the copy of a registration certificate in some country. Merely having a pending trademark application is not enough. However, it may be possible to meet this proof by showing evidence of common-law trademark rights, which arise from actual use rather than from a formal registration...."
Sounds a lot like someone read the comments submitted by the editor of Domain Mondo to the CWG draft proposal. Sounds like, at the very least, the CWG is not rushing anymore to meet the ICG's faux timetable deadline. Has Google Fallen Out Of Love With ICANN's New gTLDs? Are ICANN's new gTLDs (new generic top-level domains) just another passing fad or a defunct idea now destined for the great trash bin in cyberspace, at least as far as Google is concerned? Google is notorious for abandoning products and services, almost on a whim--remember Google Reader, Google Buzz, Google Orkut, Google Desktop, Google Labs, Google Health, iGoogle, and many, many more? While most Silicon Valley companies rejected, scoffed at, and even laughed derisively at ICANN's money-grab a/k/a the new gTLDs program--Google jumped in with both feet at the beginning, applying for more than 100 new gTLDs, through its own Google Registry as well as setting up its own branded Google Registrar. Google has gone out of its way recently to reiterate that new gTLDs do not, and will not, receive any SEO boost over .COM or other domain extensions, proving once again that you cannot believe anything that comes from the new gTLD proponents. In fact, as current trends of cybersquatting and other illegal uses of new gTLDs continue, who knows what effect future algorithmic changes in the great Google bot will have on new gTLDs? Most people have heard of the Internet Archive, but do you know about the HTTP Archive? The Internet Archive (a/k/a the "Wayback Machine") keeps track of Web Content over time, while the HTTP Archive keeps track of how digital content is contructed and served on the Web over time. About the HTTP Archive: "... In 1996 Brewster Kahle realized the cultural significance of the Internet and the need to record its history. As a result he founded the Internet Archive which collects and permanently stores the Web's digitized content. In addition to the content of web pages, it's important to record how this digitized content is constructed and served. The HTTP Archive provides this record. It is a permanent repository of web performance information such as size of pages, failed requests, and technologies utilized. This performance information allows us to see trends in how the Web is built and provides a common data set from which to conduct web performance research... "
The Internet Archive and the HTTP Archive are both useful sources and tools for web developers, designers, creators, publishers, and domain name registrants, or anyone in the domain name industry or involved with internet governance. Related: Article: Cuba’s Promising New Online Voices: "... In December 2010, nearly three years after he took power from his ailing brother Fidel, Raúl Castro called on Cubans to be critical of the system, acknowledging that the Communist Party had failed its citizens in myriad ways. Cuba’s diverse and growing community of bloggers and independent journalists have done just that, becoming a powerful alternative to the official press, which for decades has delivered hyperbolic and dull content, but little substantive journalism... "
Interesting podcast embedded below which relates the story of the owners of longform.org seeking to buy the domain name longform.com. At one point they thought they were being deceived by well-known domain name investor Mike Berkens of The Domains--but subsequently found out they were completely wrong, and in the process, received an insight into the world of domain name investing and brand protection. (Michael Berkens' interview is toward the end of the podcast.) Enjoy! 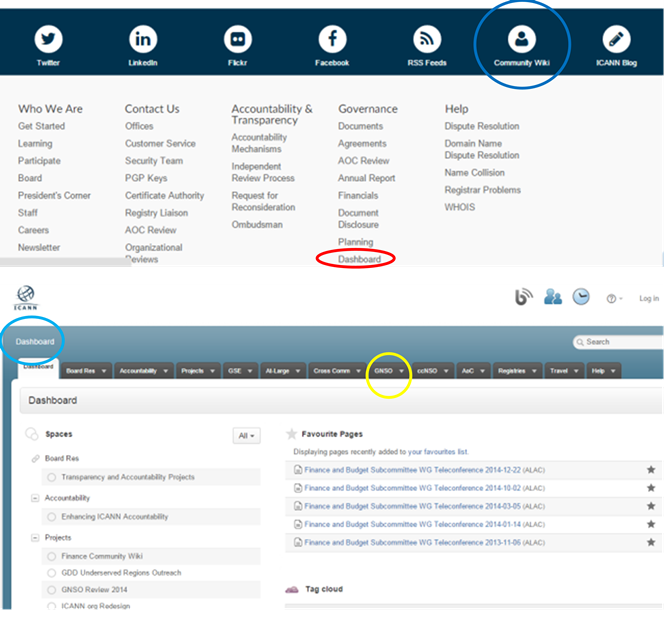 Is ICANN Sabotaging the Accountability and IANA Transition Processes? Quick, can anybody explain the difference between the CWG and CCWG, and what do either have to do with ICANN accountability or the IANA stewardship transition processes? ICANN Dashboard--this is where a "lot of stuff" at ICANN is "buried"--no "quicklink" from the ICANN homepage--in fact, the link in the footer at the bottom of ICANN's homepage which says "Dashboard" will lead you to a dead page of something else altogether. However if you find "Community Wiki" on the ICANN homepage, click it and you will go to the page called "Dashboard" (see screenshot above). Then go to the "GNSO tab" to find (if you are lucky) info re: the CWG and its documents, e.g., a survey (pdf) being taken of CWG "members and participants:"
"This survey is based on suggestions from the public comments, as well as additional, related questions. The goal is to get a high level sense of the views of CWG participants (i.e., Members and Participants) regarding these suggestions prior to the intensive work weekend on 10-­11 January. To the extent possible, Members should make choices that they believe reflect the views of the group they represent; when that is not possible, they should express their personal opinion. (We assume that Members may not have time to go back to their respective groups in a timely fashion; there will be an opportunity for that later, as [meaning "after"?] we develop the final proposal.)..." It's pretty clear from the above that the CWG is succumbing to "deadline dysfunctionality" imposed by ICANN and the ICG, increasing the chances for a very poor result from the overall IANA stewardship transition process. Ironically, ICANN's intention for a short deadline in order to get the result it preferred, may have in fact backfired into the complex solution proposed in the CWG draft proposal. More Problems Crop Up With Universal Acceptance of Top Level Domains (by Ram Mohan): "... George Santayana quote, "Those that cannot remember the past are doomed to repeat it" ...[is] an apt warning for what is currently happening — again — with the hundreds of new generic Top Level Domains (gTLDs) that are launching... and failing to work as expected on the Internet... [I]n the early 2000s, seven new gTLDs were launched: .AERO, .BIZ, .COOP, .INFO, .MUSEUM, .NAME and .PRO... Any TLDs that were more than three characters long promptly ran into usability issues. I know this from first-hand experience with .INFO, for which my company, Afilias, is the registry operator... I spent a good part of my time, in the first five years after .INFO launched, working with vendors to get their systems to accept .INFO email addresses and .INFO domain names as valid. Now, 13 years later, it's still possible to find systems that reject .INFO addresses. From that experience, I developed my three rules of TLD acceptance. An old TLD [e.g., .COM, .NET, .ORG] will be accepted more often than a new TLD. An ASCII-only TLD will be accepted more than an IDN TLD. A two or three letter TLD will be accepted more often than a longer ccTLD or gTLD. But I guess the money ICANN was collecting from new gTLD applicants was too hard to resist--particularly when you look and see who benefits from ICANN's exploding revenue--the exorbitant compensation, benefits, and "expense reimbursements" for ICANN directors, officers and staff, expanding offices and overhead, excessive payments to ICANN-favored third parties etc., for contractor "services." 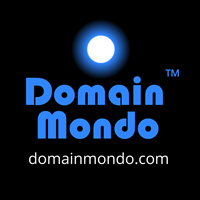 Question: "Is it a deceptive, unfair or fraudulent business practice to "sell" or "offer for registration" domain names that do not work across the Internet?" UPDATE: see ICANN 52, Universal Acceptance, New gTLD Domain Names "break stuff"
CentralNic ... - Finance News - London South East: "... the Internet Corporation for Assigned Names and Numbers [ICANN] to downgrade their demand projections to 15 million domain registrations under the new top level domains by June 2015 from 33 million...."
So how badly are ICANN's new gTLDs failing? Well, ICANN originally predicted 33 million new gTLD domain name registrations in FY15 (Fiscal Year 2015: July 1, 2014-June 30, 2015), then "lowered the bar" by more than half in the adopted ICANN FY15 budget to just 15 million new gTLD domain name registrations in FY15. So where are we at the end of the first half of FY15 (December 31, 2014)? 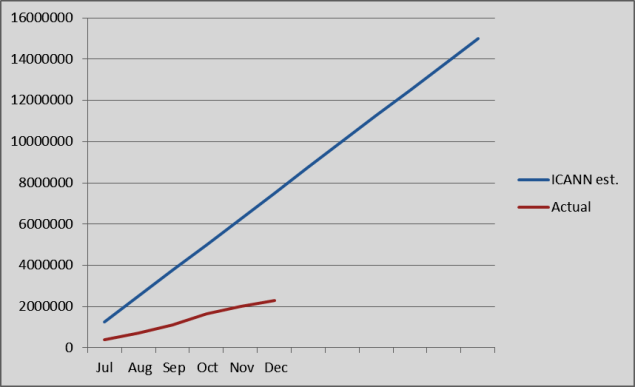 According to ntldstats.com* there were 1,418,338 new gTLD registrations at the end of FY14 (June 30, 2014). If you subtract that from 3,715,143 total new gTLD registrations at the end of calendar year 2014,* then there were only 2,296,805 new gTLD registrations in the first-half of FY15 (including the hundreds of thousands of new gTLD registrations given away for free!) --meaning ICANN and "whomever ICANN listens to," were "delusional" about the demand for new gTLDs. Of course this shouldn't surprise anyone--ICANN made monumental mistakes in its new gTLDs program, including not considering "registrant demand for new gTLDs" as a "relevant factor" in deciding whether to even authorize any new gTLDs. Instead ICANN decided to just flood the Internet Domain Name System (DNS) with hundreds of unwanted, unneeded domain extensions because there were fools willing and able to pay ICANN $185,000 per new gTLD for the right to do so, or to participate in ICANN's auctioning off of the Internet DNS to the highest bidders. Remember, for ICANN, itself a monopoly, "It's all about the money" and to heck with the public interest and Internet security and stability. Based on the trends thus far (see chart below), new gTLD registrations for all of FY15 will not only fall far short of the ICANN budgetary estimate of 15,000,000, but in fact will be "lucky" to total even a third of that (5,000,000). 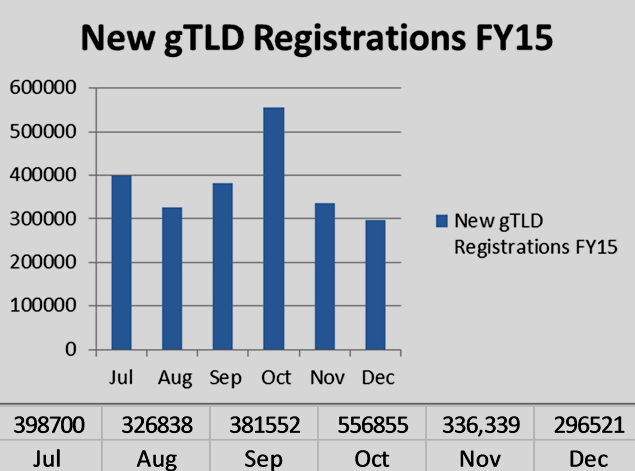 And that is without even taking into consideration that renewals of new gTLD registrations will begin in 2015 for the first time--how many domain name registrants who received those hundreds of thousands of "free" new gTLD domain name registrations in 2014, will actually pay to renew those mostly worthless new gTLD domain names in 2015?